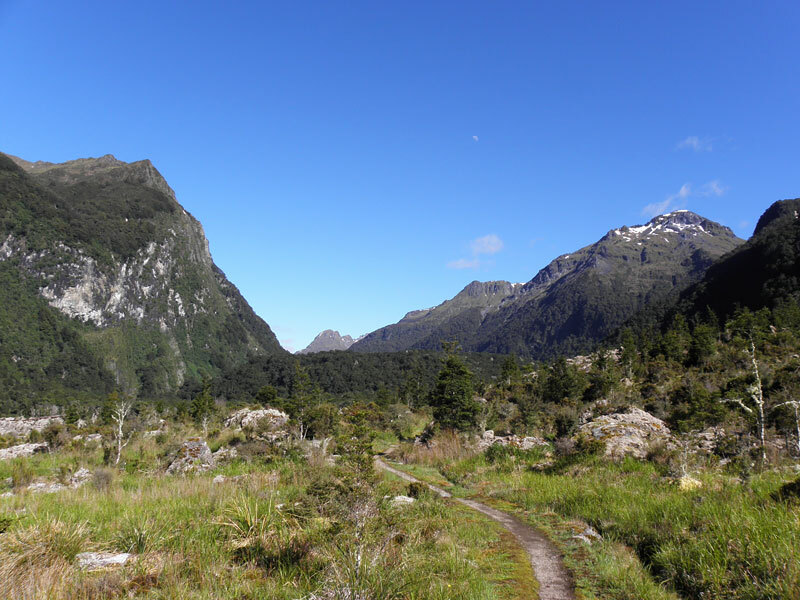 Along with Milford and Routeburn the Kepler track is one of the great walks on the South Island. 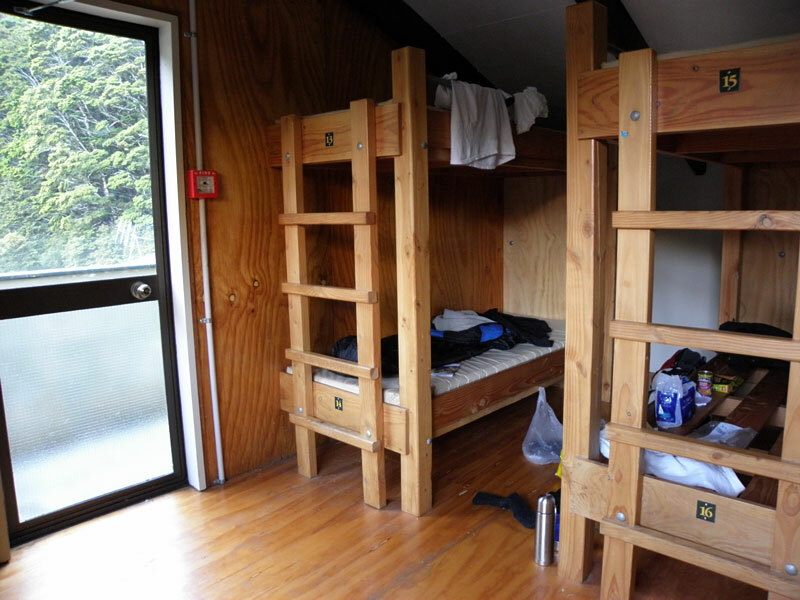 Compared to Milford, Kepler is much less crowded and good alternative for those seeking silence and huts packed with people. 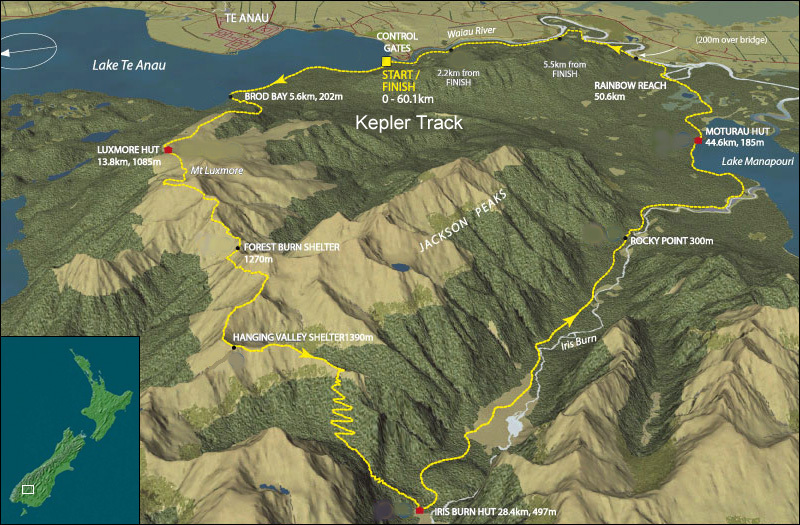 Kepler is a three or four day round trip with a great variety of scenery. 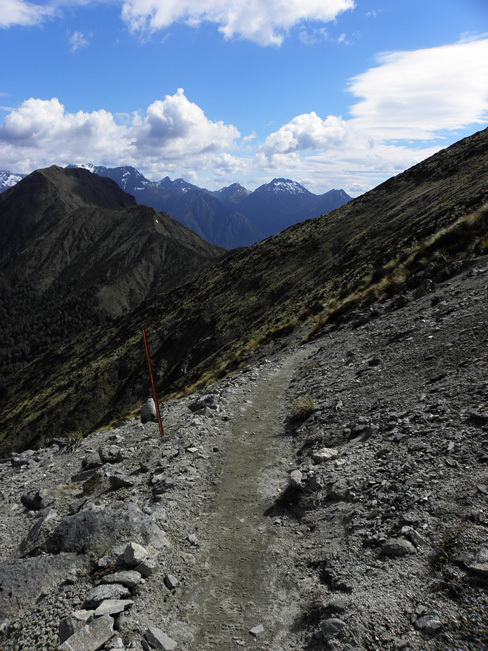 The track starts at the Lake Te Anau control gates and climbs from the lakeshore to Luxmore Hut. 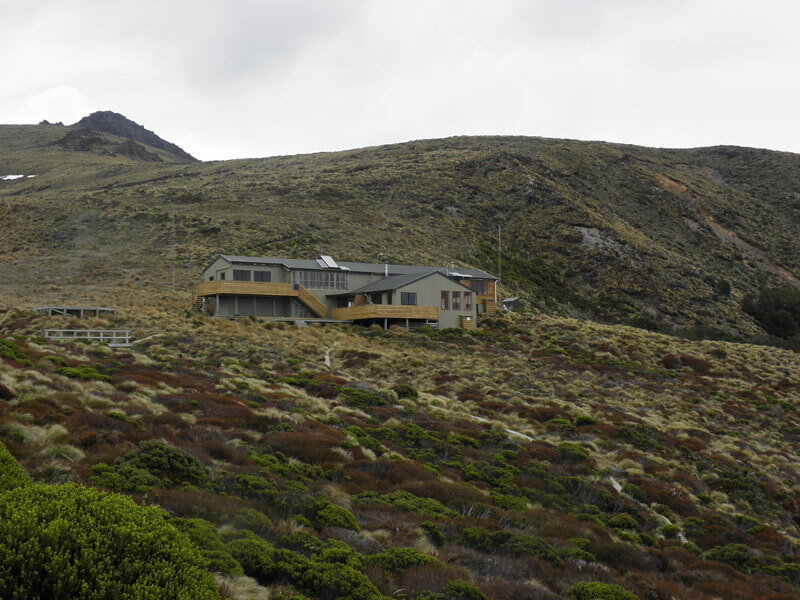 On the second day it crosses exposed alpine ridge tops and descends to the Iris Burn Hut. 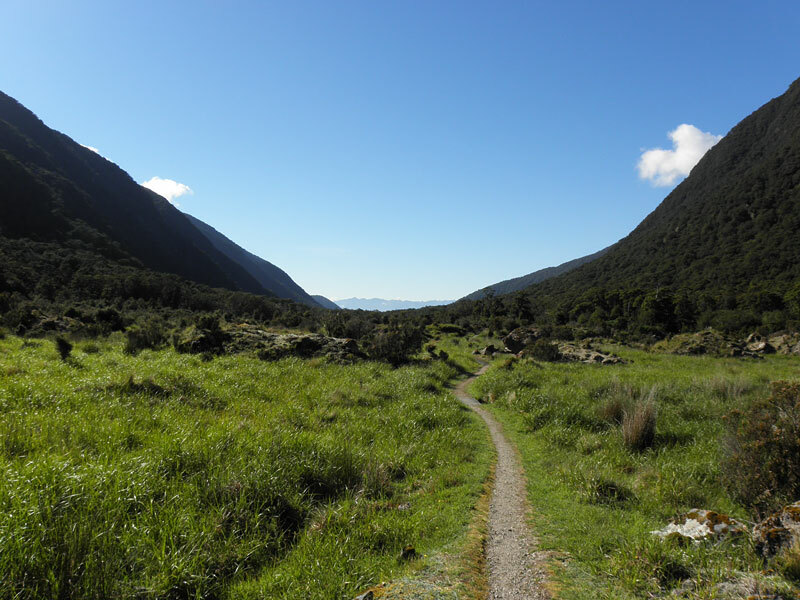 The third days walk follows the Iris Burn, a glacial valley, to Moturau Hut on the shore of Lake Manapouri. 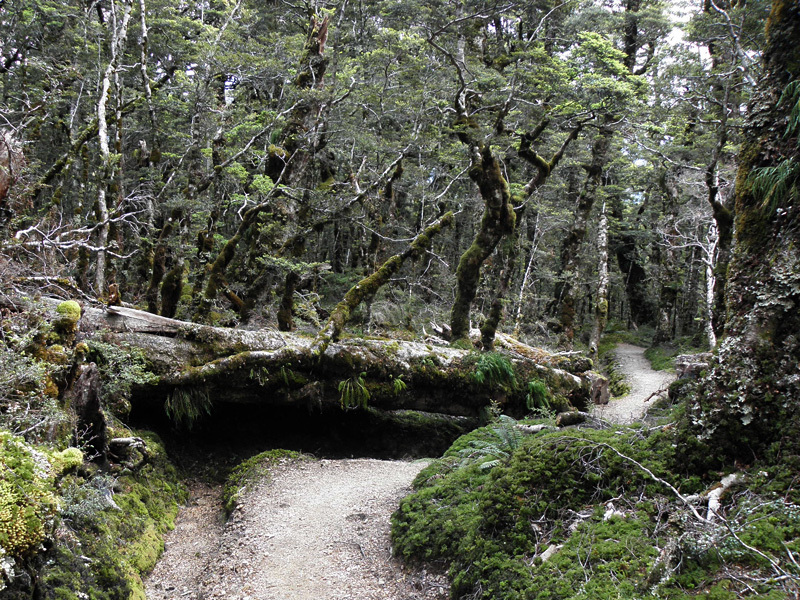 The Kepler track is not an easy walk. 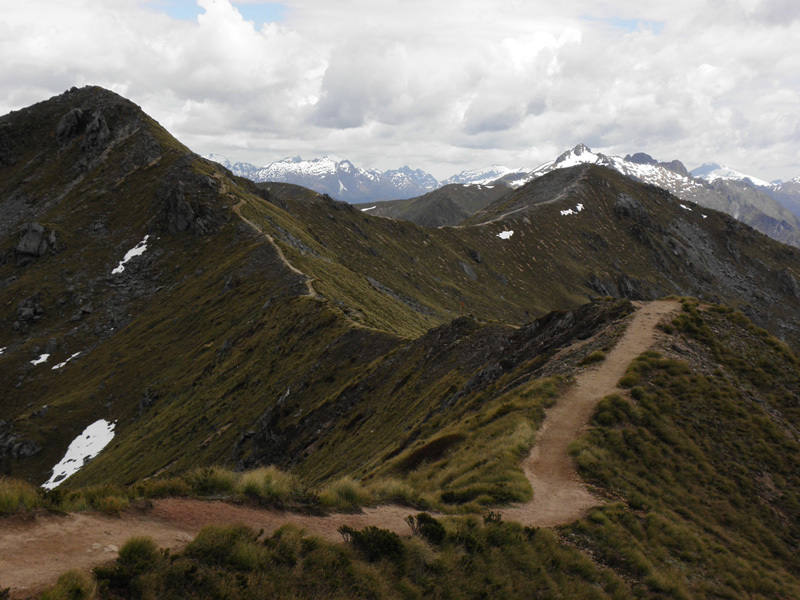 Walking on the exposed mountain tops in bad weather can lead to hypothermia if sufficient care is not taken. Be well prepared! 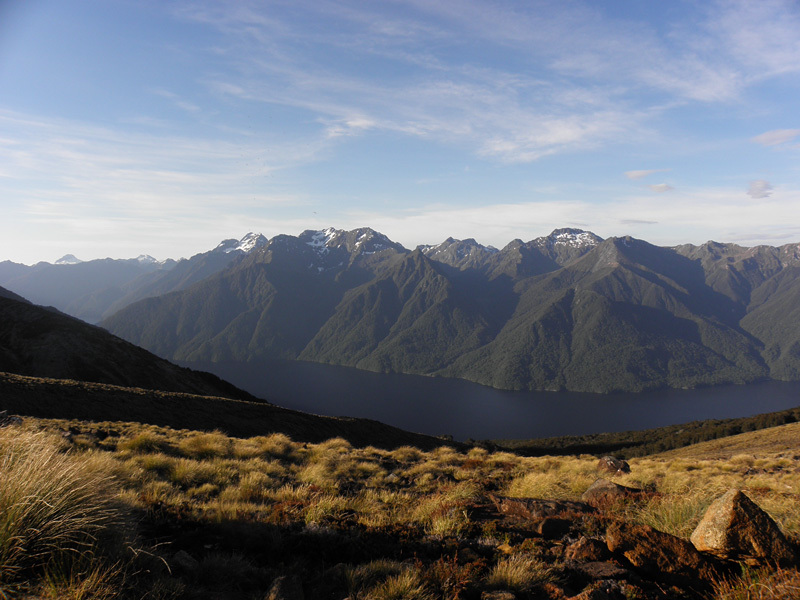 View at Lake Te Anau towards north in the evening of my arrival to Te Anau on 25th November. 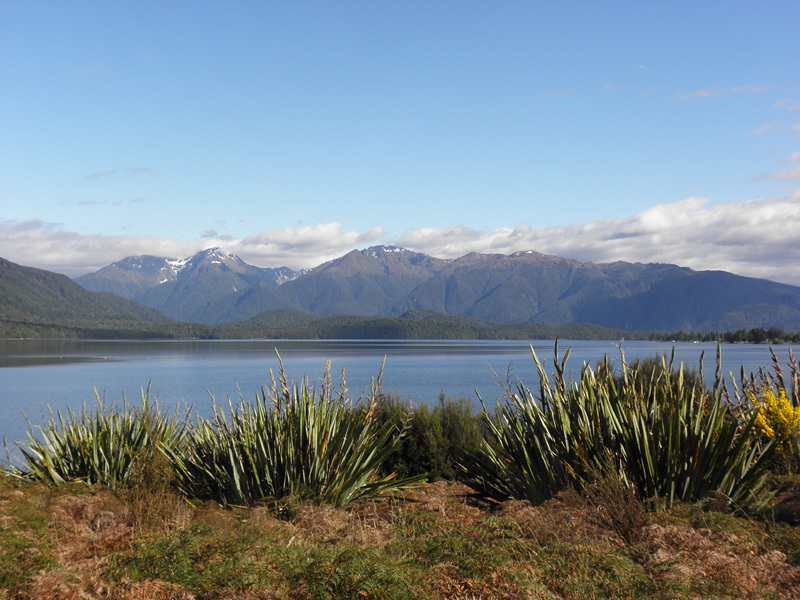 View in early morning from my accomodation at Te Anau on 26th November. 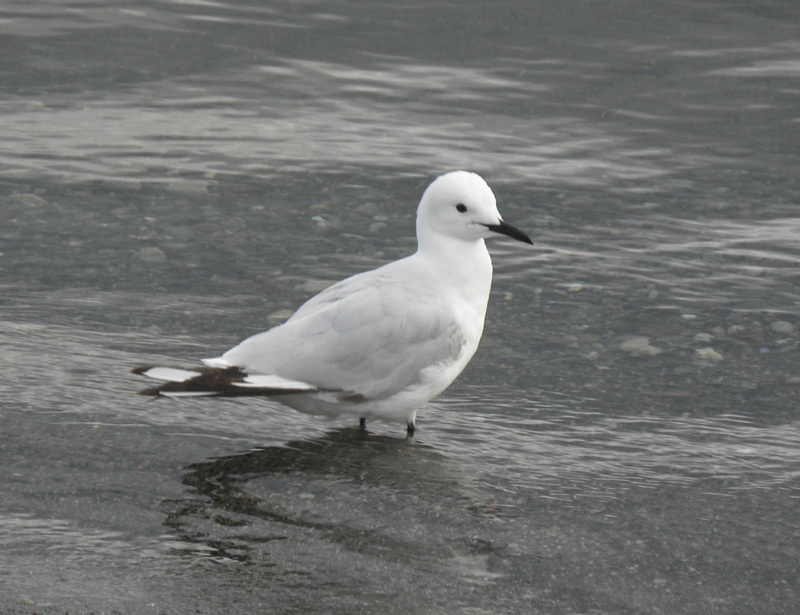 A nice Black-billed Gull, which were fairly common along the beaches. 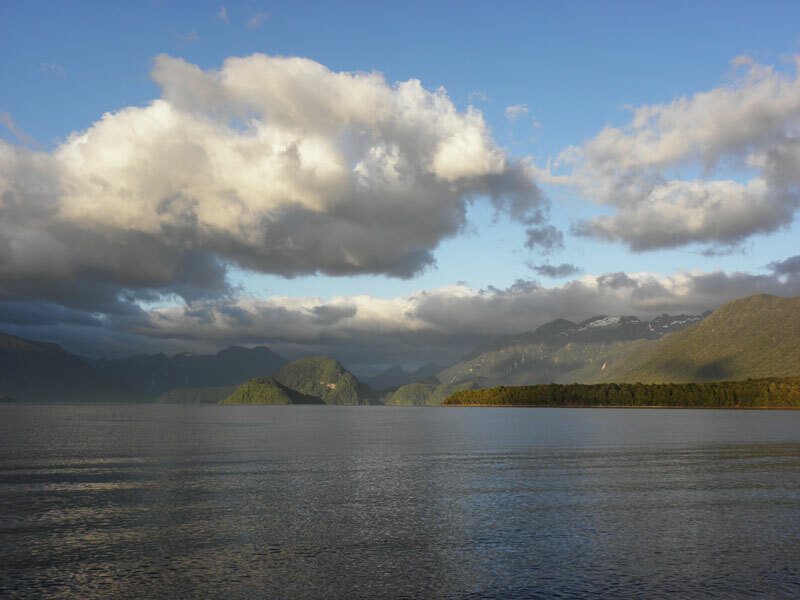 View from Dock Bay at the southern part of Lake Te Anau, close to the control gates where Kepler Track start. 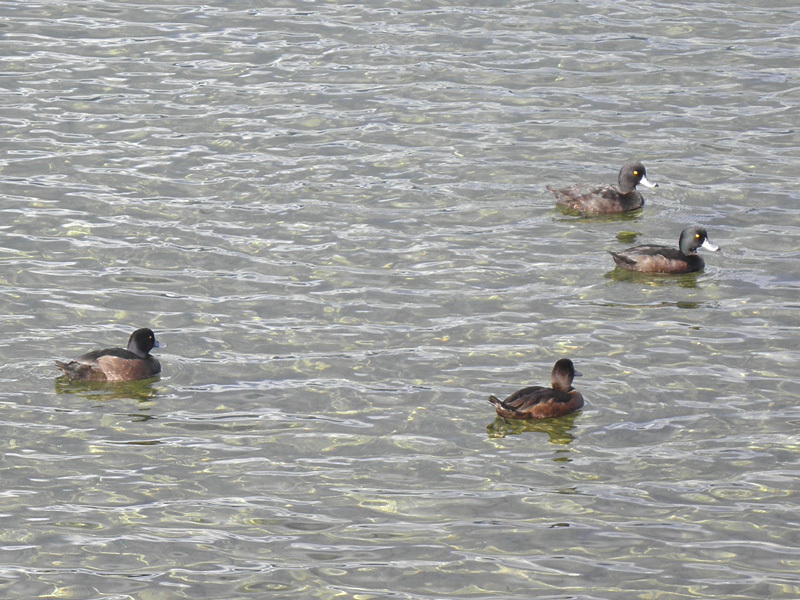 The endemic New Zealand Scaup. At the control gates. Finally I am about to experience this longed-for walk. Good weather conditions and in very good spirit! 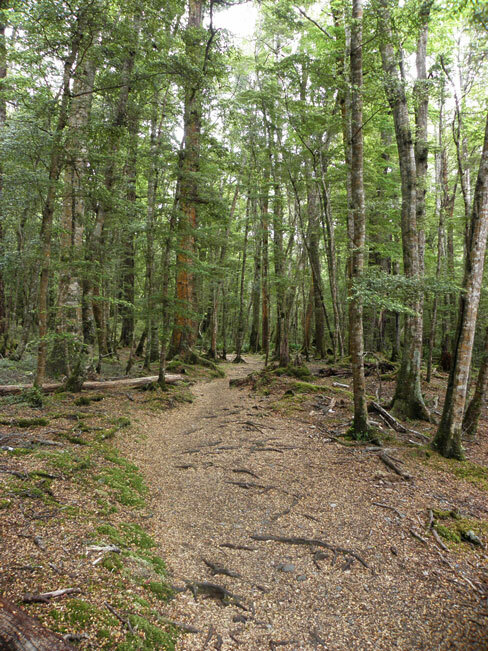 At lower altitudes mountain, silver and red beech grow alongside kamahi, and podocarps such as miro, rimu, kahikatea and totara. 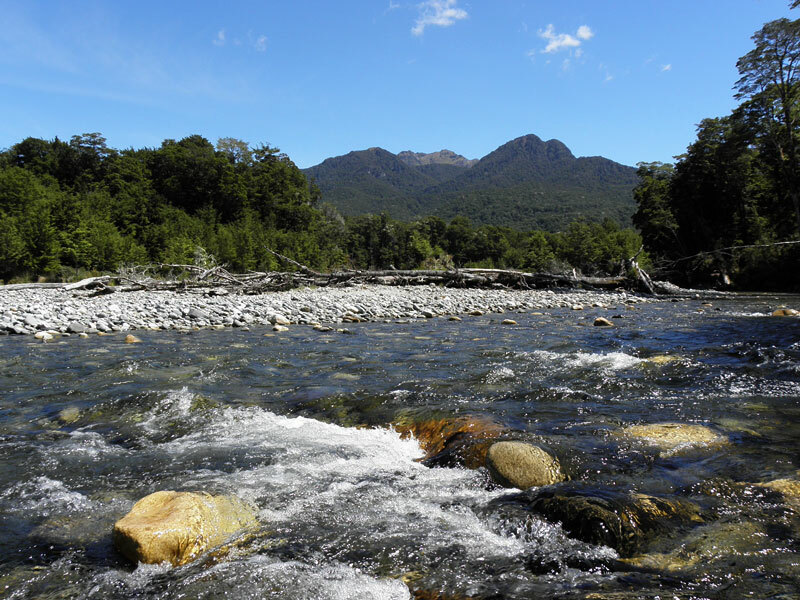 Here along the shore of Te Anau. Birds such as Tui, Bellbird, Grey Warbler and Tomtit were fairly common. Beautiful forest toward the tree line and Luxmore, were silver beech dominates. 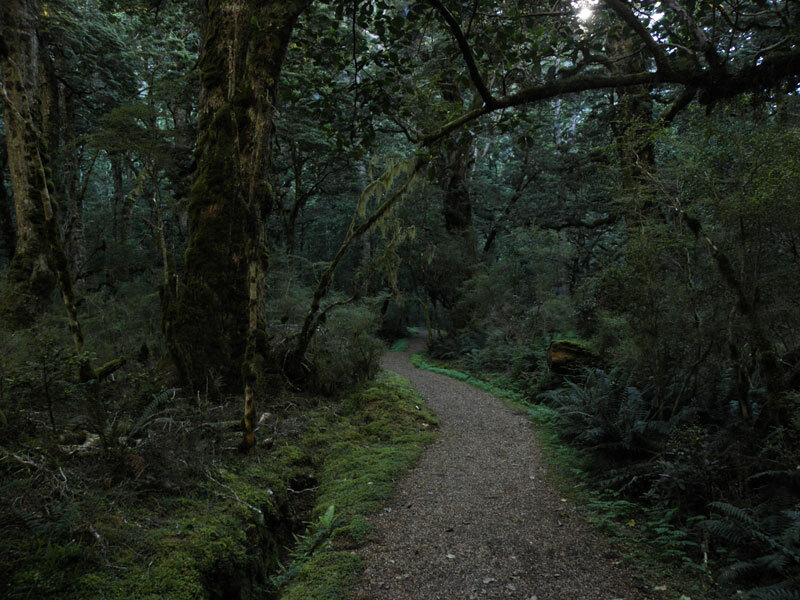 A feature of the forest is the abundance of ferns, mosses and perching plants. 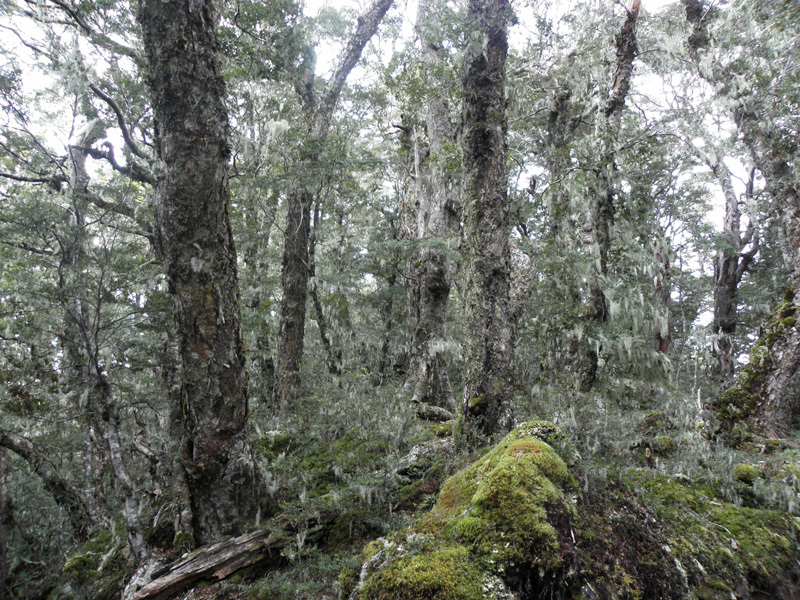 Almost like a canvas painting depicting trees covered by silvery mosses. In afternoon of the first day, before reaching the subalpine area of Luxmore. 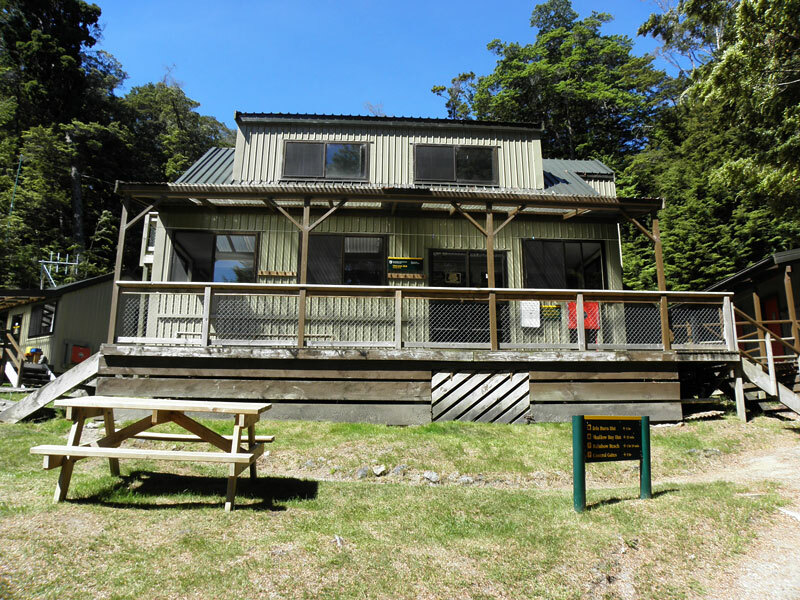 Luxmore Hut. The place for staying over the first night. The hut offered awesome views and we were only ten people staying for the night. 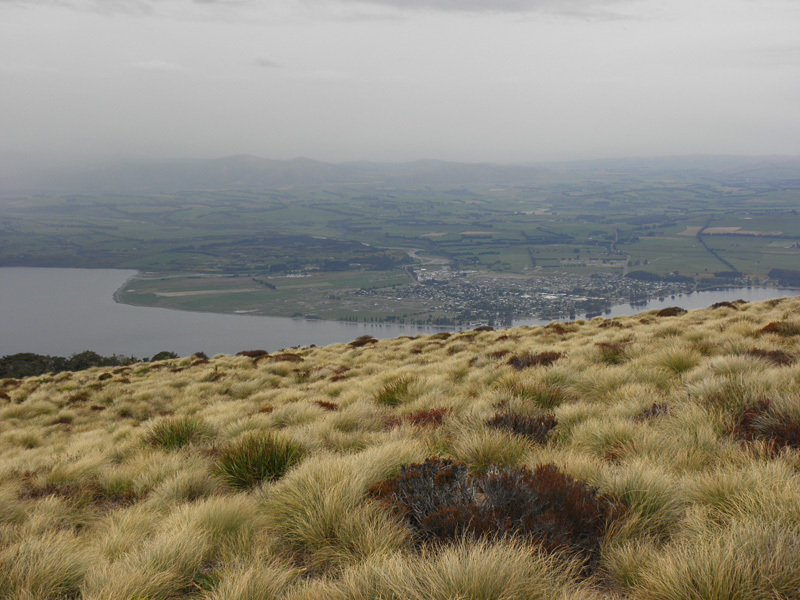 Te Anau seen from the Luxmore ridge in the afternoon of 26th. Awesome view from Luxmore in the evening. I just sat there for at least an hour enjoying the views in all directions as well the total silence. 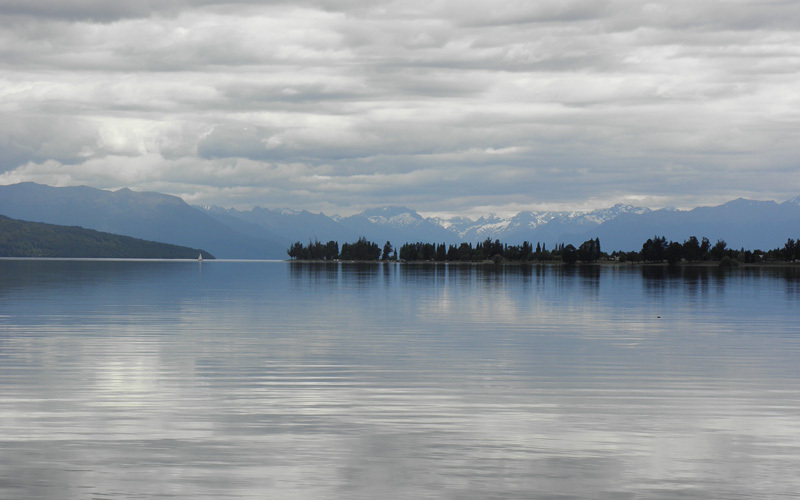 Early morning the second day and a boat travelling through the South Arm of Lake Te Anau. 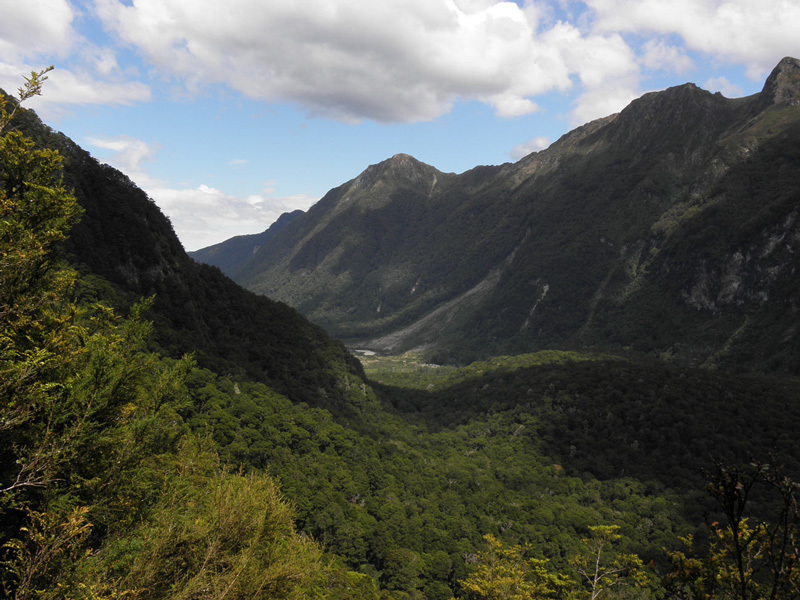 The large and flightless Takahë, once thought to be extinct, was rediscovered in this remote mountain area (Murchison Mountains) across the lake in 1948 by Geoffrey Orbell. 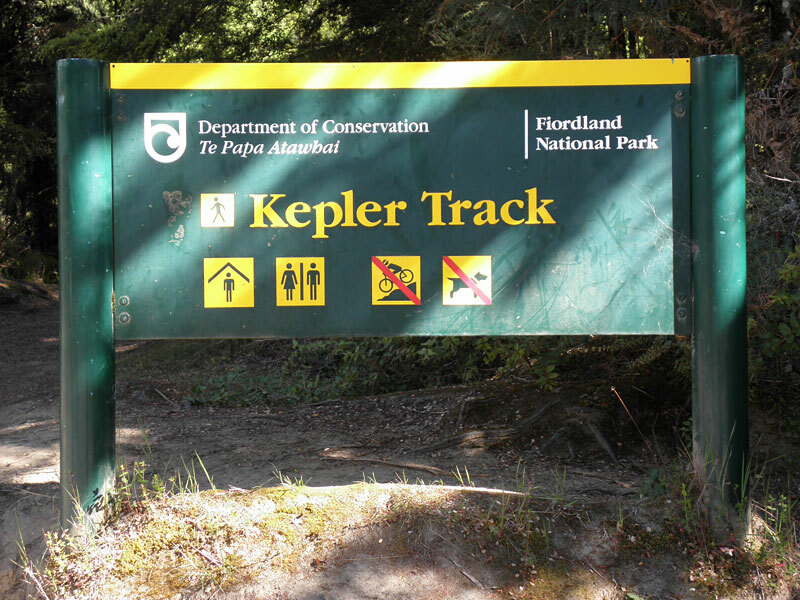 This area has been set aside as a Specially Protected Area and access is restricted to permit holders only. 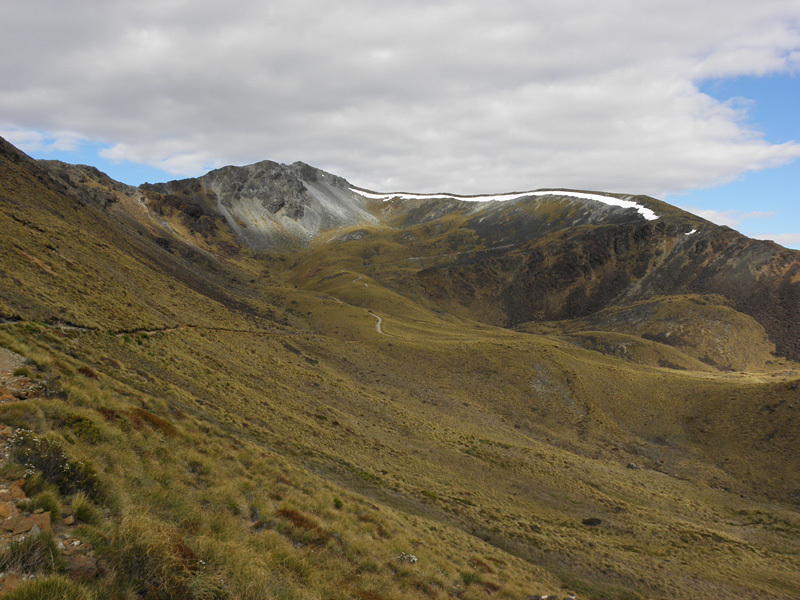 The slopes of Mount Luxmore. 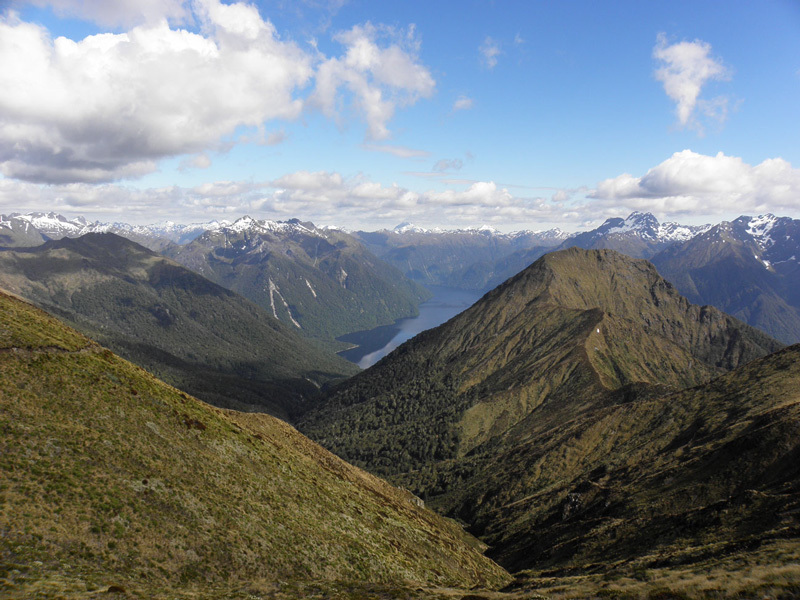 View from Mount Luxmore ridge.. Morning on the second day. 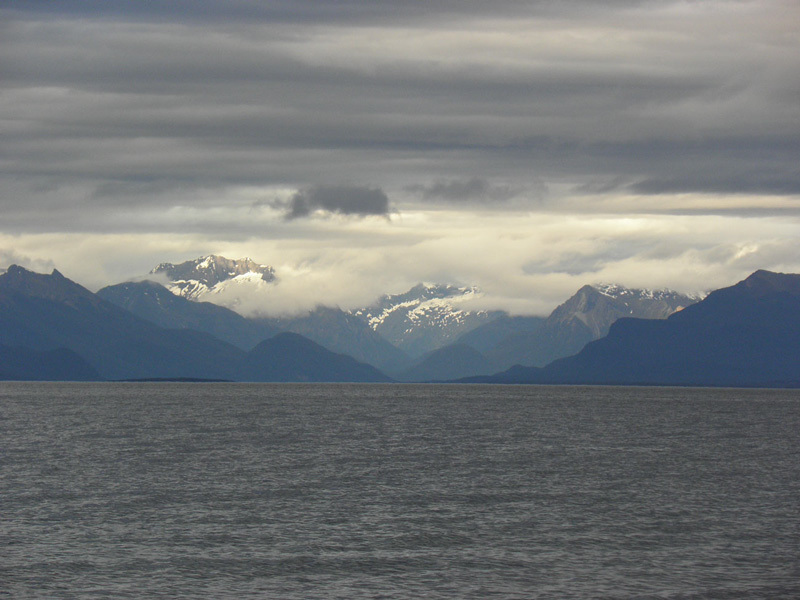 View towards north and the end of South Arm. Magnificent and so silent! Part of the track at the alpine section, which could be difficult in bad weather conditions. 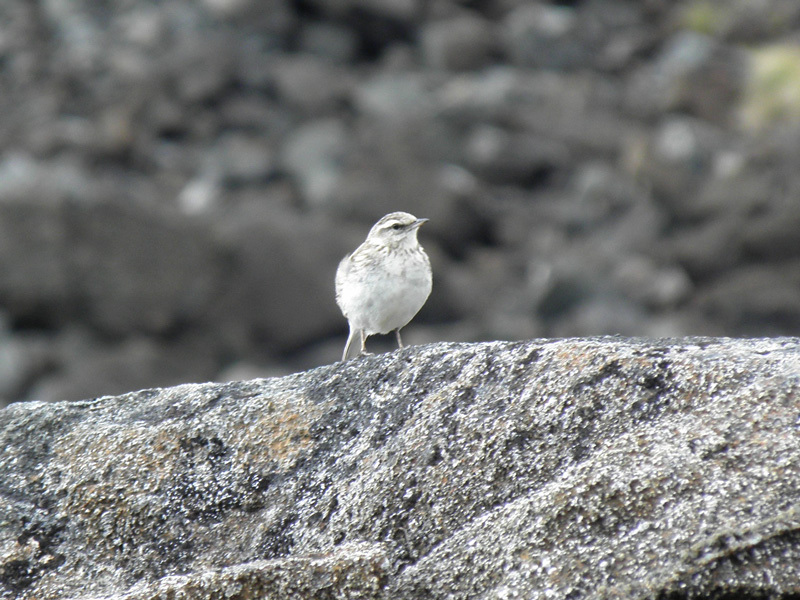 All the time I was looking for the most wanted Rock Wren, but no one were to be seen. 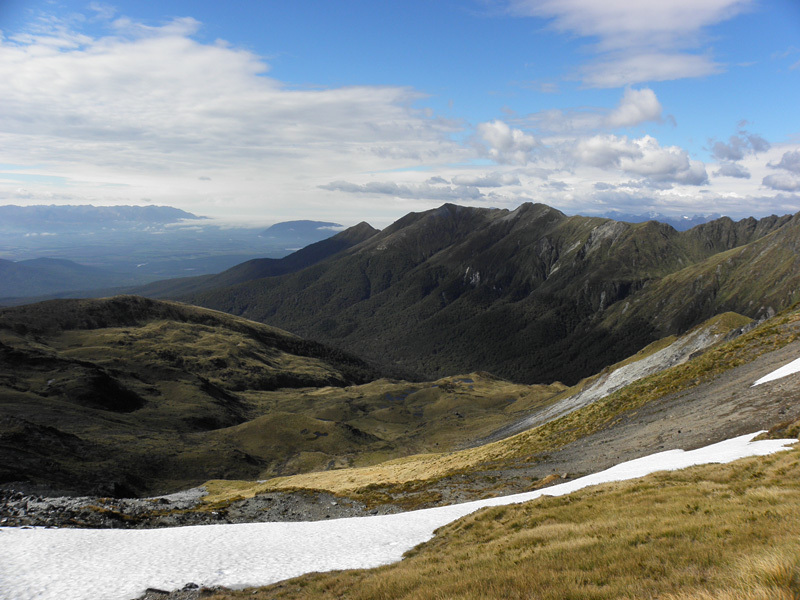 NZ Pipits were seen now and then along the alpine section, as well as several Keas and two lovely NZ Falcons. View from Forest Burn Shelter area. 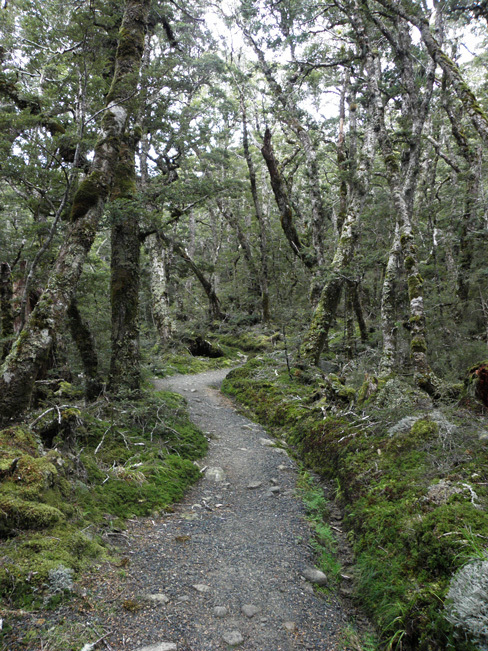 The winding track along the ridge between Forest Burn and Hanging Valley Shelter. Me at Hanging Valley Shelter. Having a small break and lunch with a Mexican couple and a pair of Kea. 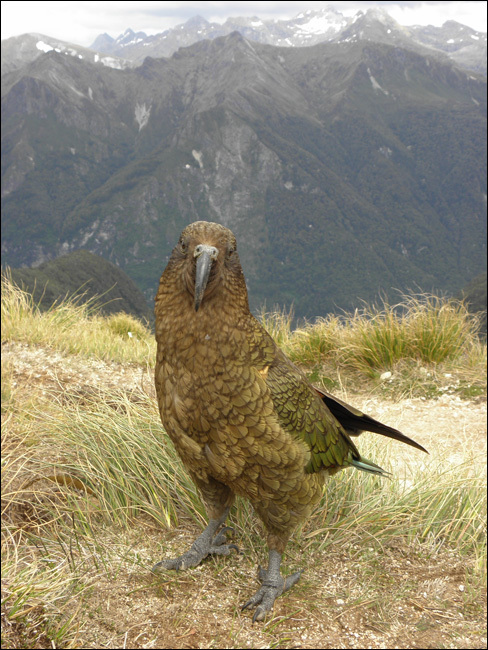 The Kea, New Zealand's cheeky mountain parrot is a bird with "attitude". Raucous and inquisitive, the bird is not afraid of humans and puts on colourful displays for visitors. 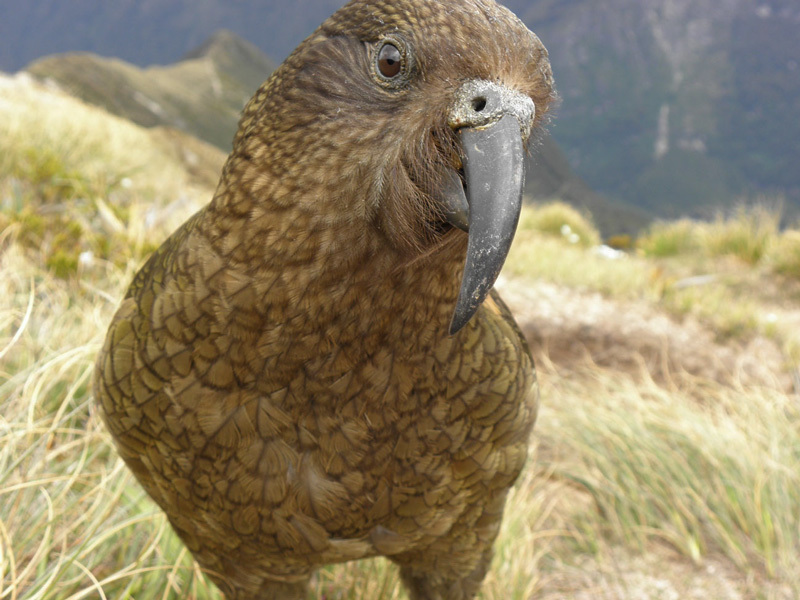 A close-up of a extremely curious Kea! 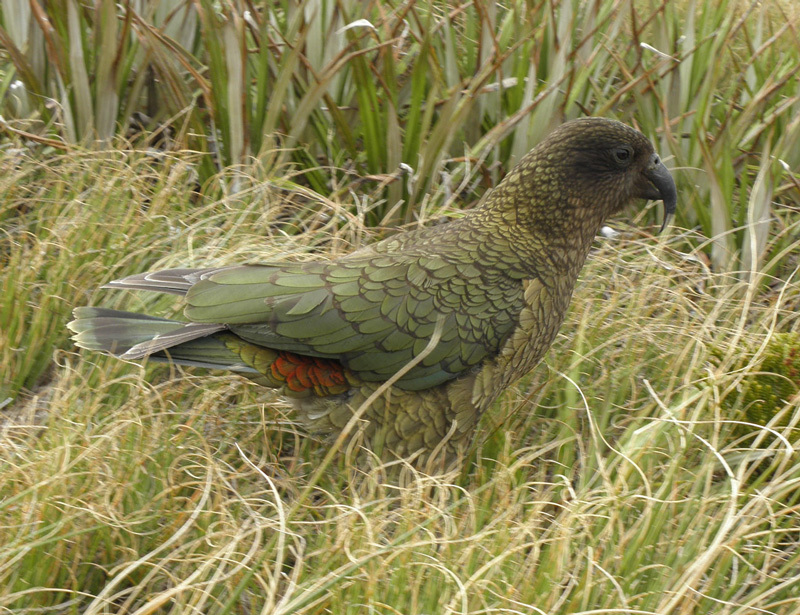 One of two lovely and playful Keas at the Hanging Valley. 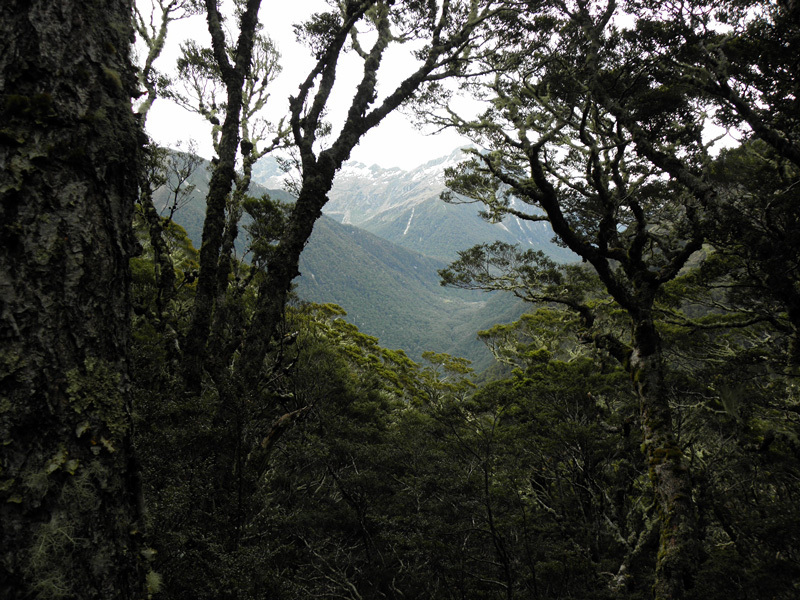 From Hanging Valley the track follows a long, open ridge toward the Iris Burn and descends via a series of zigzags the track descends through a most beautiful forest. Concerning birds the lovely little Rifleman were common and I found several nesting birds. NZ Pigeons, Brown Creepers, Fantails, Tomtits, Grey Warblers, Yellow-fronted Parakeets, Tuis and Bellbirds were seen in good numbers! The valley of Iris Burn. 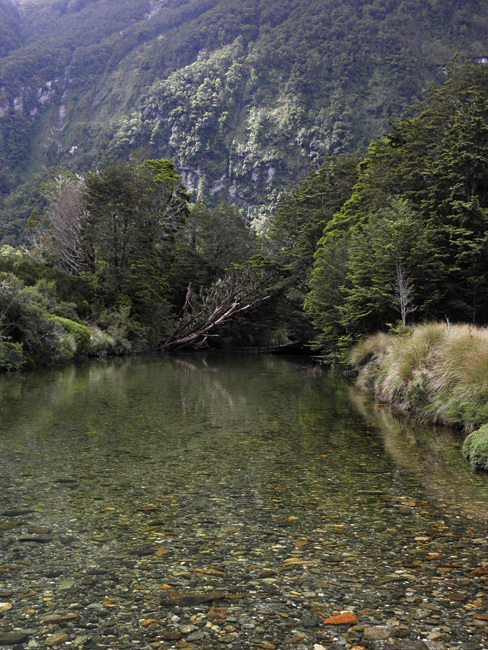 Iris Burn hut embedded in a singing forest and the river almost in front. 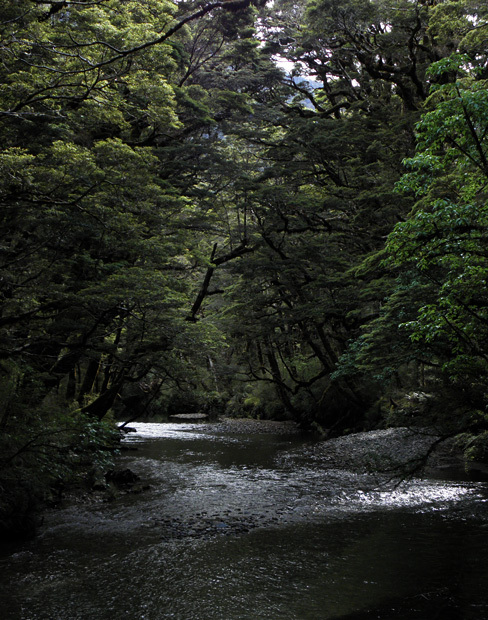 The original Rivendell? 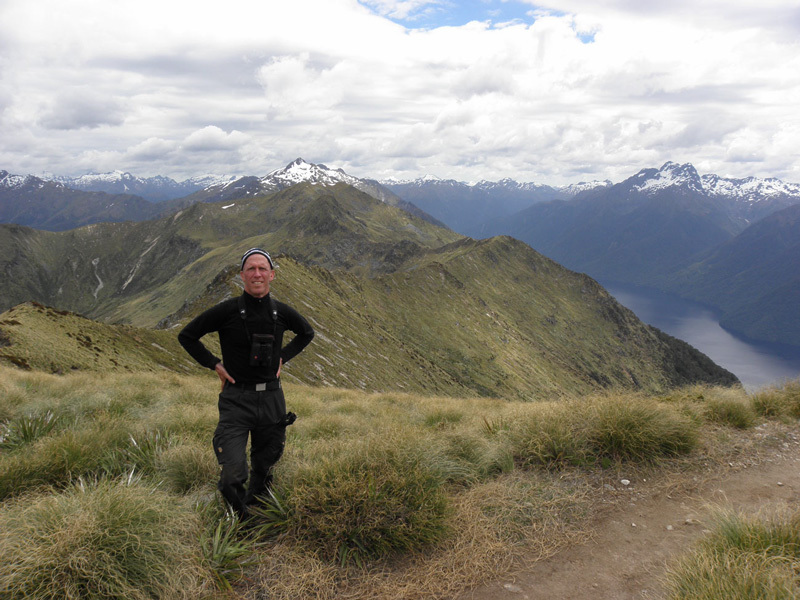 At midnight i heard 2-3 calling Brown (Fiordland) Kiwis from the hut! Usually they feed on the meadows in front of the hut, but at time the ground was too dry due to lack of rain the past two weeks. Iris Burn adjacent to the hut. 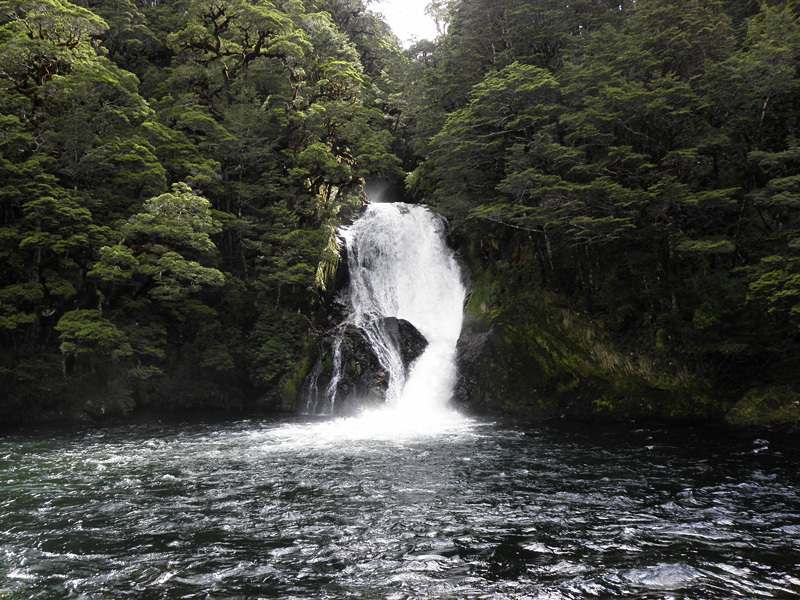 Iris Burn falls, which is located only 20 minutes from the hut. Part of Iris Burn in the evening of the second day. The hut warden told me that a birder had seen a a pair of Blue Ducks a couple of weeks prior to my visit. 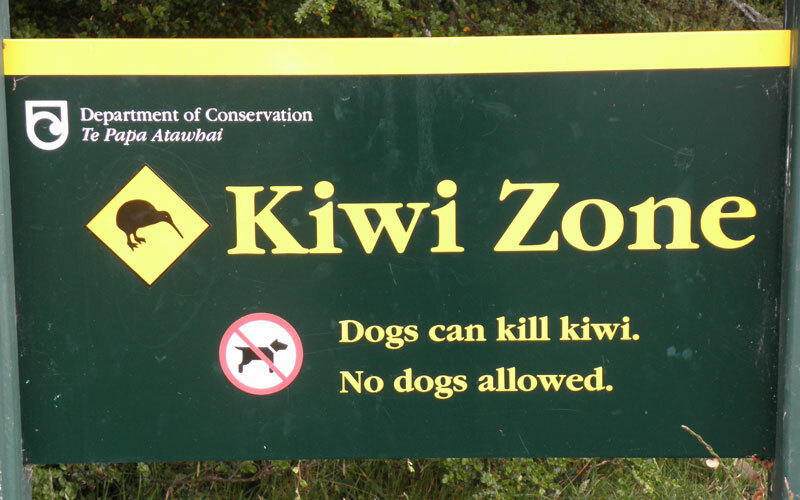 I did the walk to the waterfall along the river, but no luck. 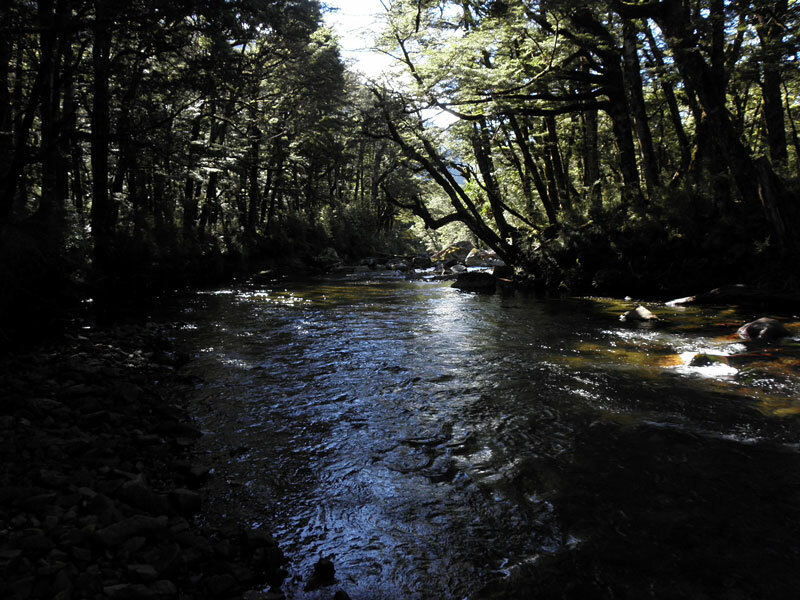 After the dinner I decided to take a walk downstreams as the river seem to get broader an perhaps more slowfloating. There were no tracks down to the broad parts of the river and the sunset was close. 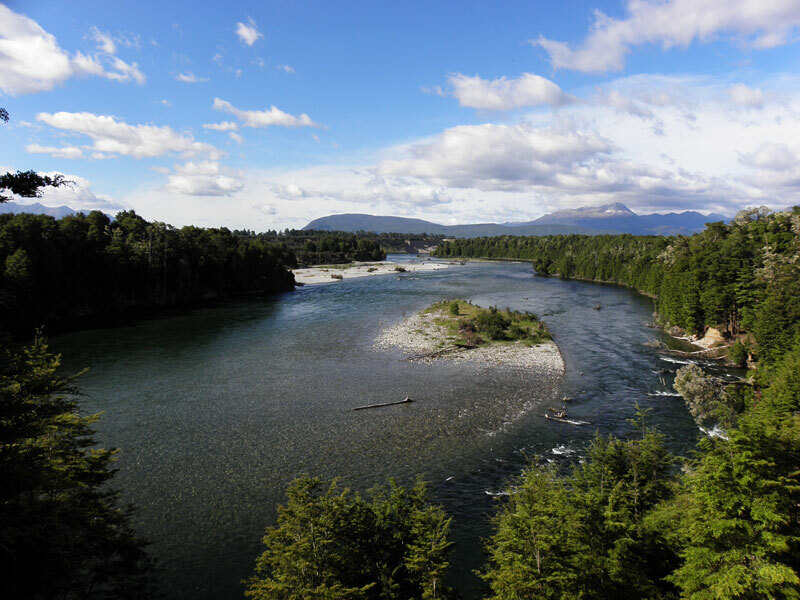 Finally I found a small hill which offered good views of the river. And I nearly got a heart attack when I suddenly saw a pair of Blue Ducks in my bins! 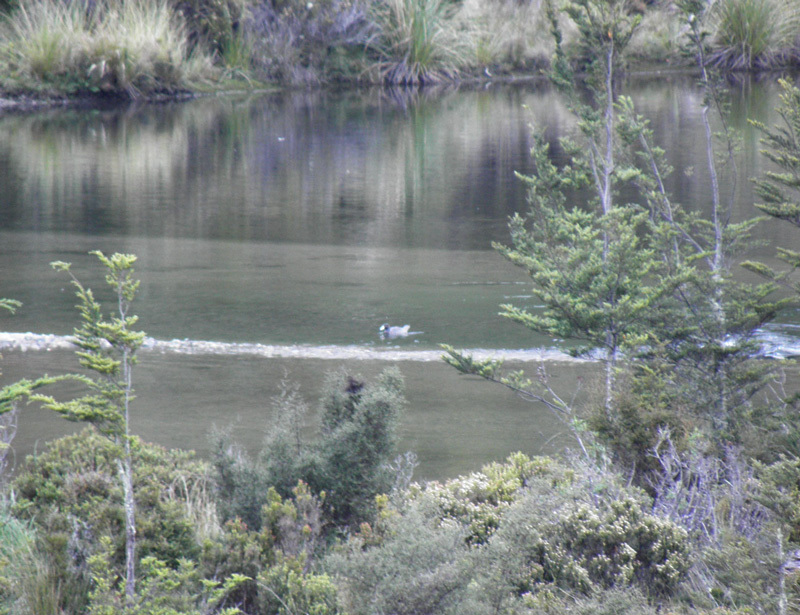 And then the male start to call with a whistling "whio" (which is the Maori name)! I just enjoyed the scene with the calling ducks in the dark slow floating river while the sun was sinking. I didn't want to get closer and disturb the birds, but I got several blurry photos taken with max zoom. Like a forest from a fairy-tale. Evening at Iris Burn. Early morning on the third day, leaving Iris Burn hut behind. View back to Iris Burn valley. The third day was very hot and luckily most of the track ran through woodlands. 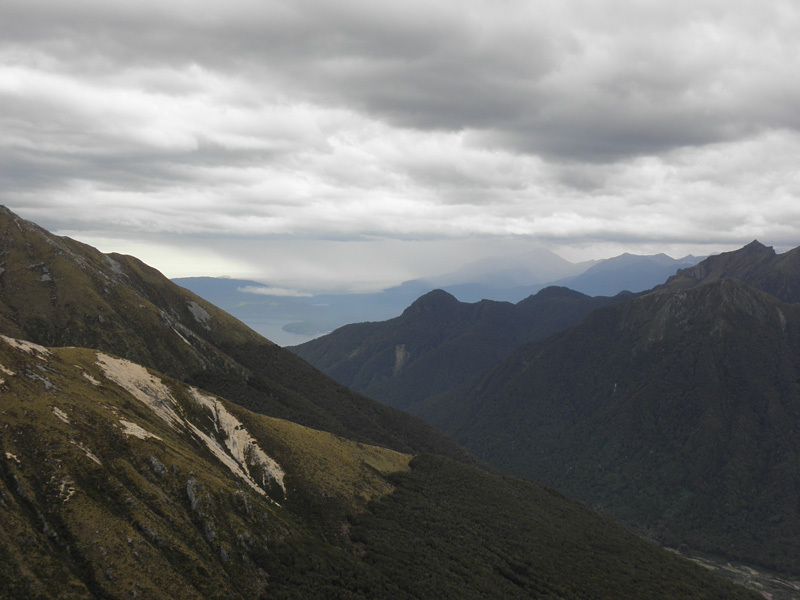 View forward to Lake Manapouri and Moturau Hut on the third day. Here a lovely Fantail. 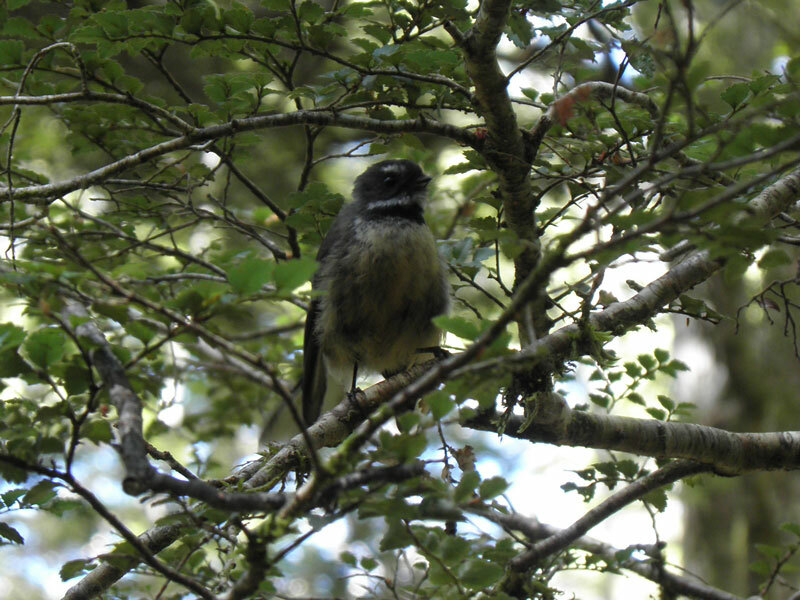 The numbers and species very almost the same as the last two days, but I saw my first South Island Robins, of which two were unbanded and were singing loudly and beautiful. 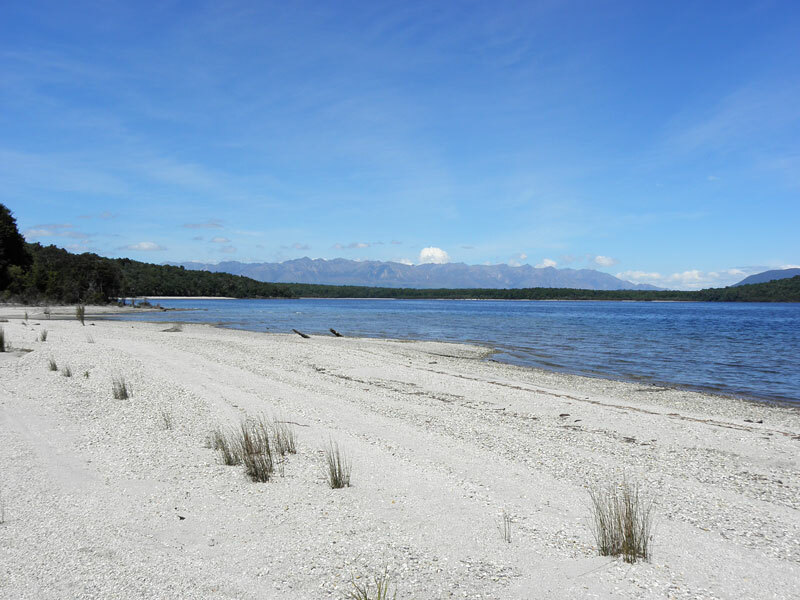 Shallow Bay in Lake Manapouri. 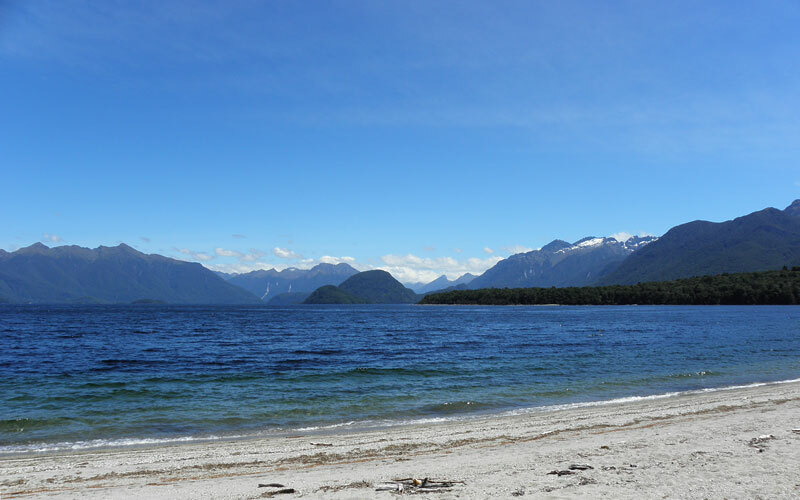 Lake Manapouri, , which originally is named by the Maoris as Moturau (Motu=islands and rau=many), the lake with many islands. 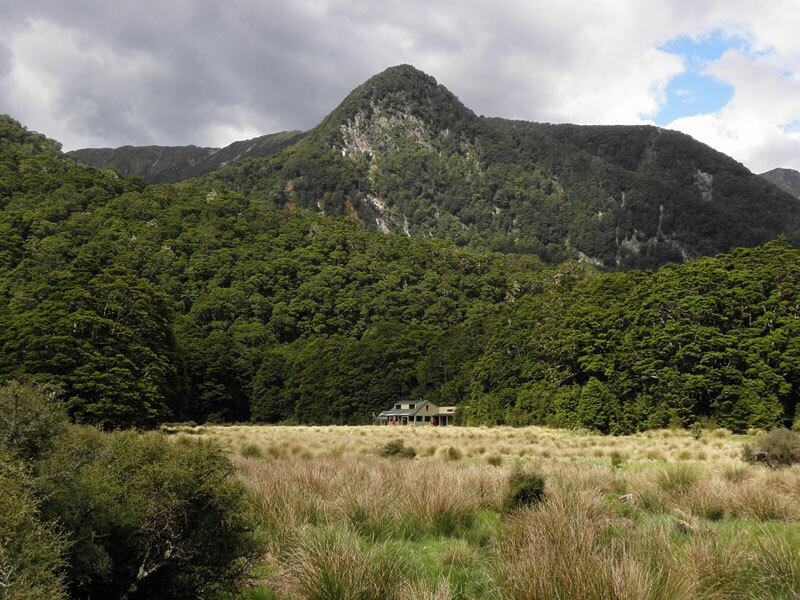 The Moturau Hut. The accommodation for the last night. My luxury suite in da hut! 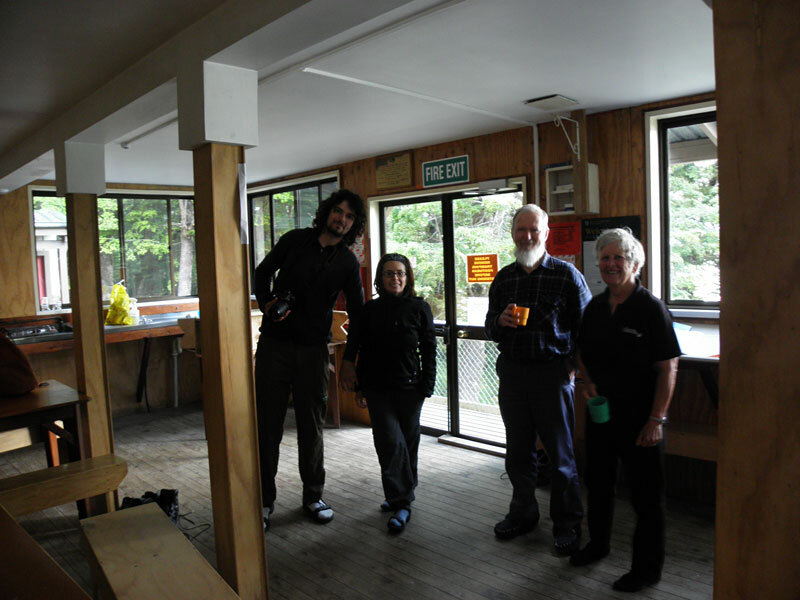 From left: Ben and Serina from Australia and Richard and Carol from Tasmania. Richard are a keen birder too. We all meet up in the evening at every hut and departed in each morning throughout the whole walk. 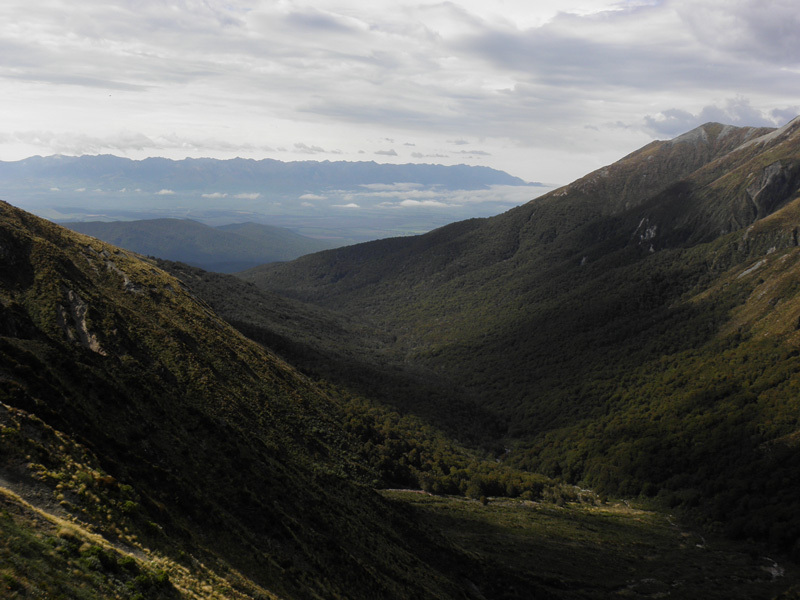 Early morning on the fourth and last day on Kepler Track. 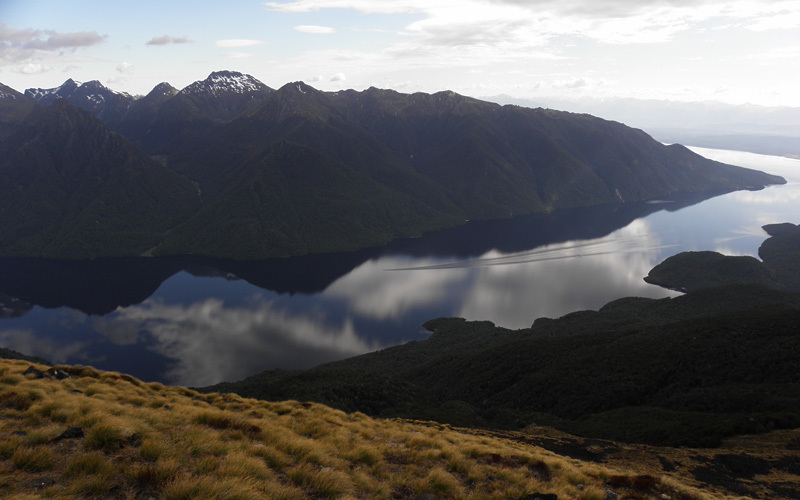 Lake Manapouri. 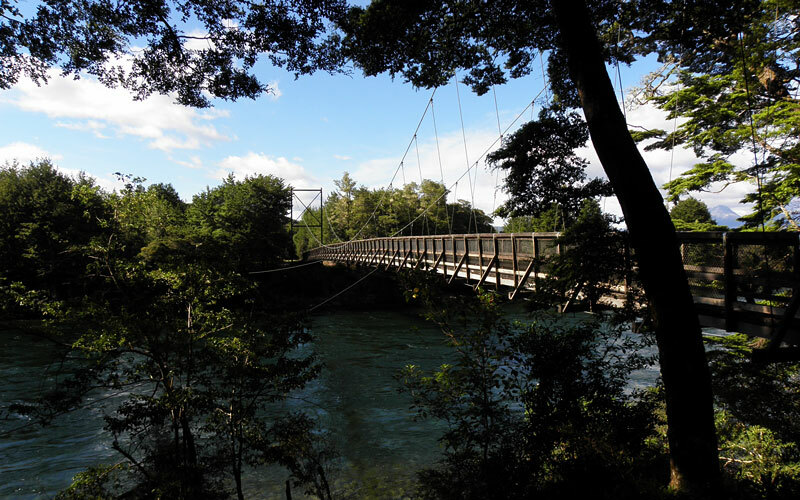 A small suspension bridge at Waiau River. 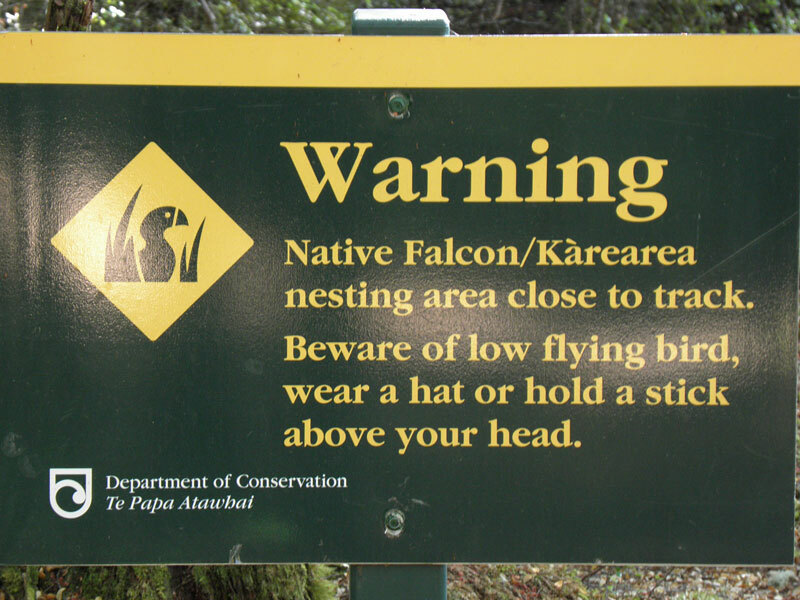 Though I didn't see any NZ Falcons here. 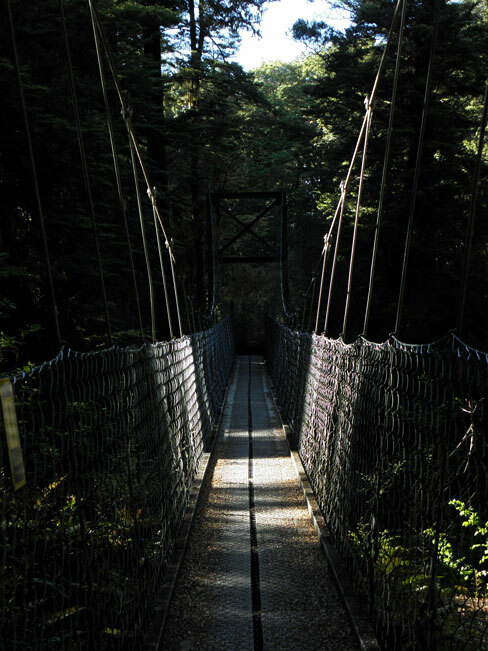 The swing bridge at Rainbow Reach. 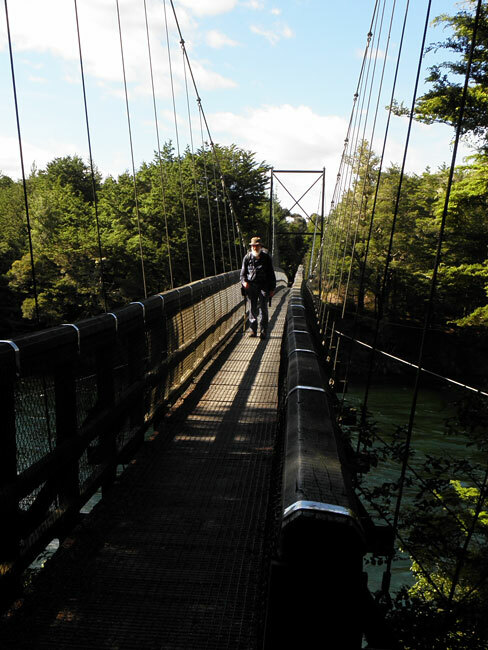 Richard testing the swing bridge. 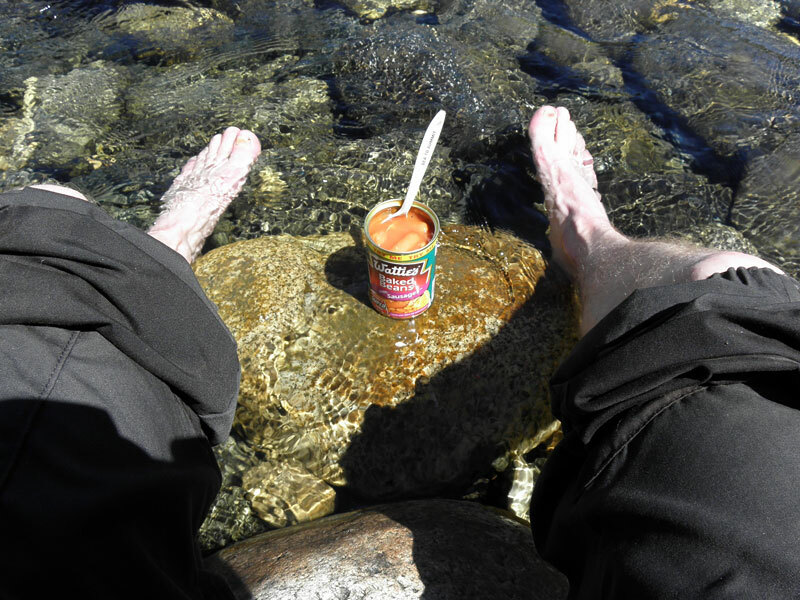 Back to civilization. 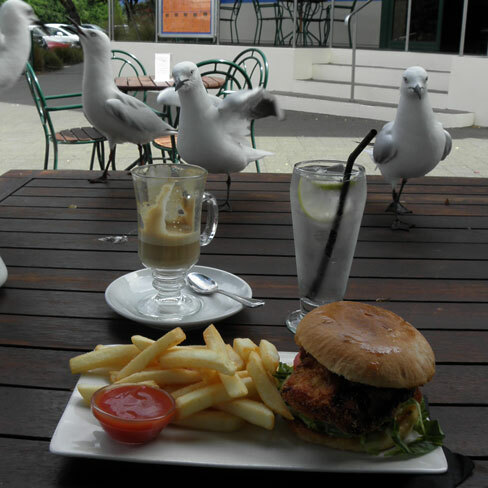 After a long shover I (and some Black-billed Gulls) enjoyed a tasty chicken burger in Te Anau. And a real latte of course!